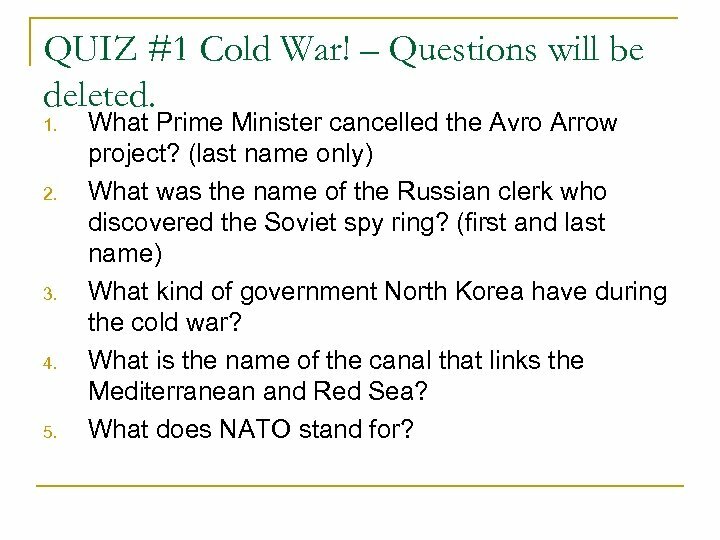 QUIZ #1 Cold War! – Questions will be deleted. 1. 2. 3. 4. 5. 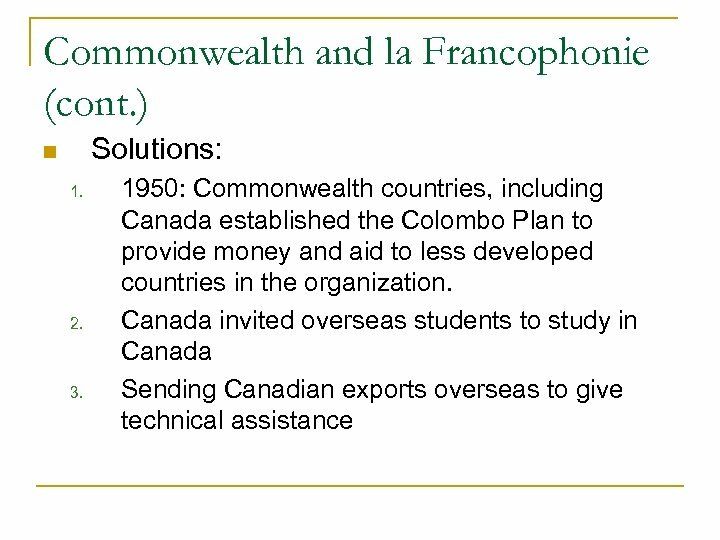 What Prime Minister cancelled the Avro Arrow project? 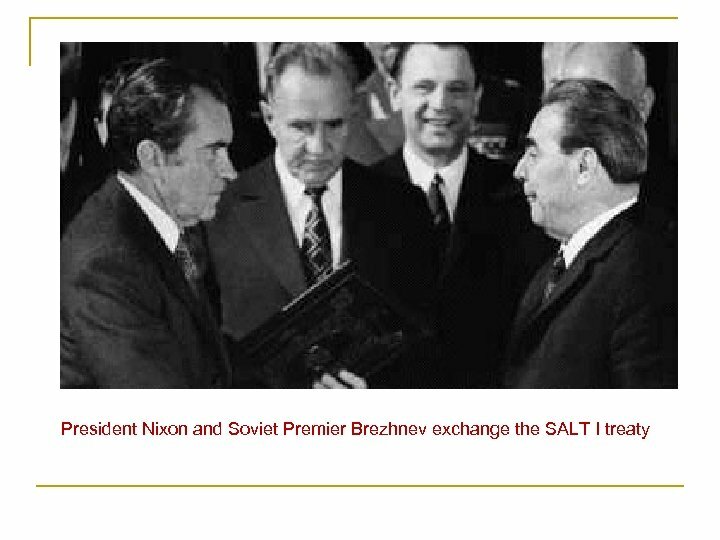 (last name only) What was the name of the Russian clerk who discovered the Soviet spy ring? 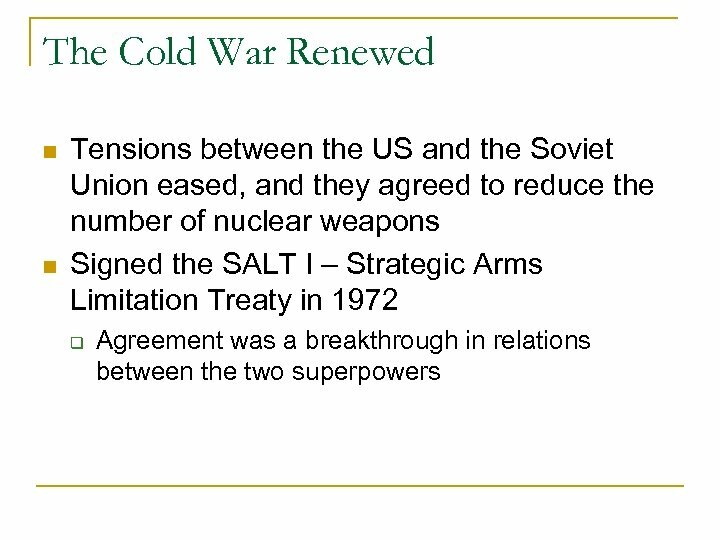 (first and last name) What kind of government North Korea have during the cold war? What is the name of the canal that links the Mediterranean and Red Sea? What does NATO stand for? 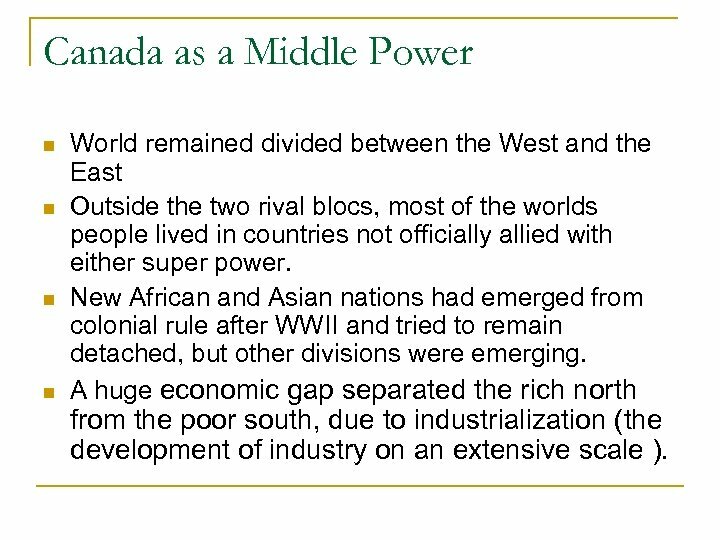 Canada as a Middle Power World remained divided between the West and the East Outside the two rival blocs, most of the worlds people lived in countries not officially allied with either super power. New African and Asian nations had emerged from colonial rule after WWII and tried to remain detached, but other divisions were emerging. 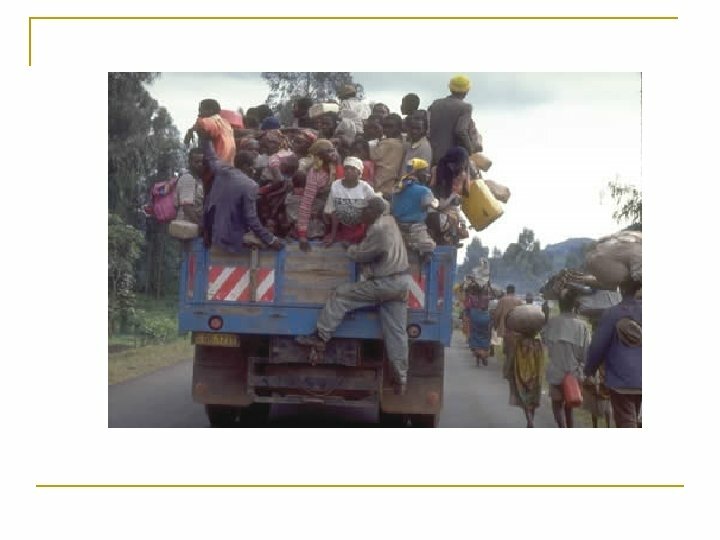 A huge economic gap separated the rich north from the poor south, due to industrialization (the development of industry on an extensive scale ). 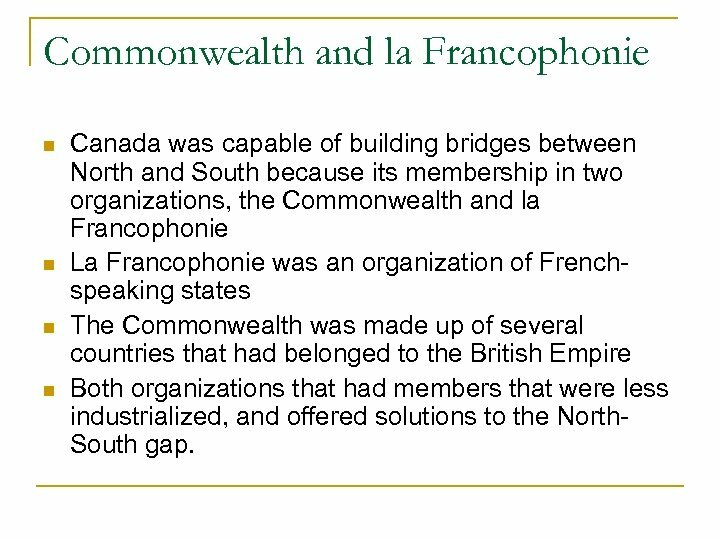 Commonwealth and la Francophonie Canada was capable of building bridges between North and South because its membership in two organizations, the Commonwealth and la Francophonie La Francophonie was an organization of Frenchspeaking states The Commonwealth was made up of several countries that had belonged to the British Empire Both organizations that had members that were less industrialized, and offered solutions to the North. South gap. 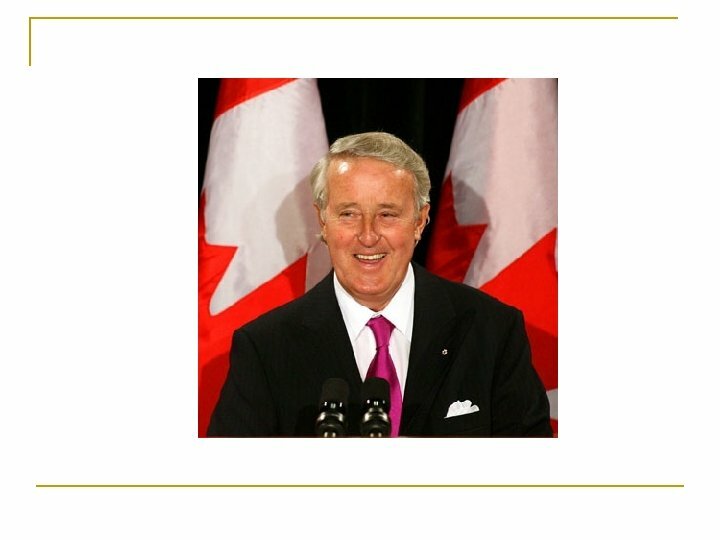 Mulroney Era Brian Mulroney became PM in Sept. 1984. 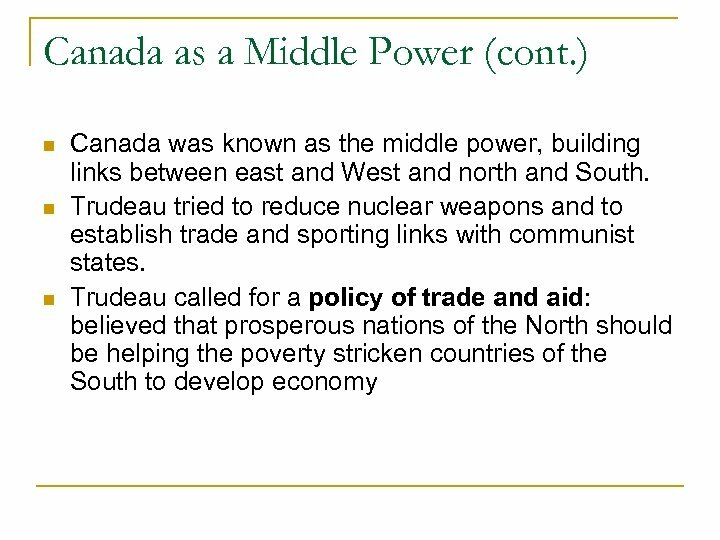 Approach to international relations was in many ways the opposite of Trudeau’s. Forge closer links with US President Ronald Reagan. They shared a similar conservative philosophy. 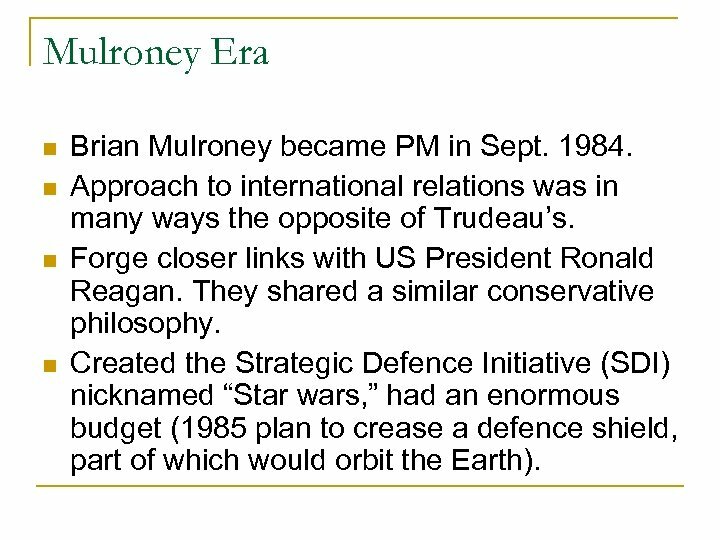 Created the Strategic Defence Initiative (SDI) nicknamed “Star wars, ” had an enormous budget (1985 plan to crease a defence shield, part of which would orbit the Earth). Mulroney (cont. ) 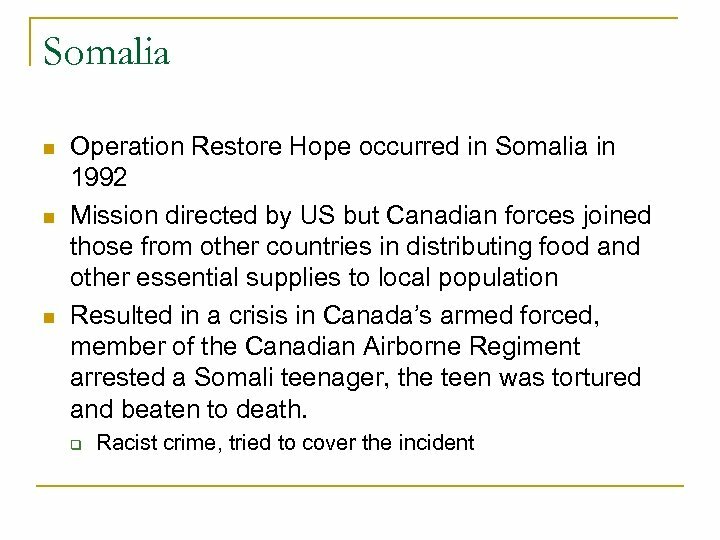 Canada belonged to Northern American Aerospace defence Command (formerly NORAD) Did membership of NORAD commit it to becoming involved? 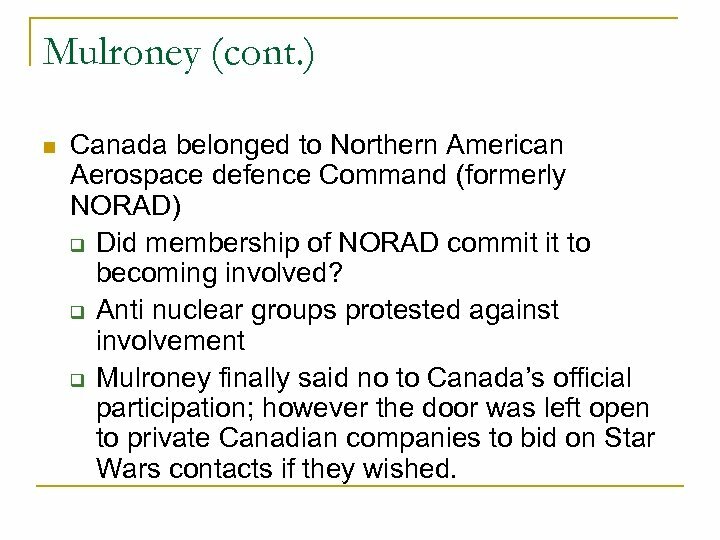 Anti nuclear groups protested against involvement Mulroney finally said no to Canada’s official participation; however the door was left open to private Canadian companies to bid on Star Wars contacts if they wished. 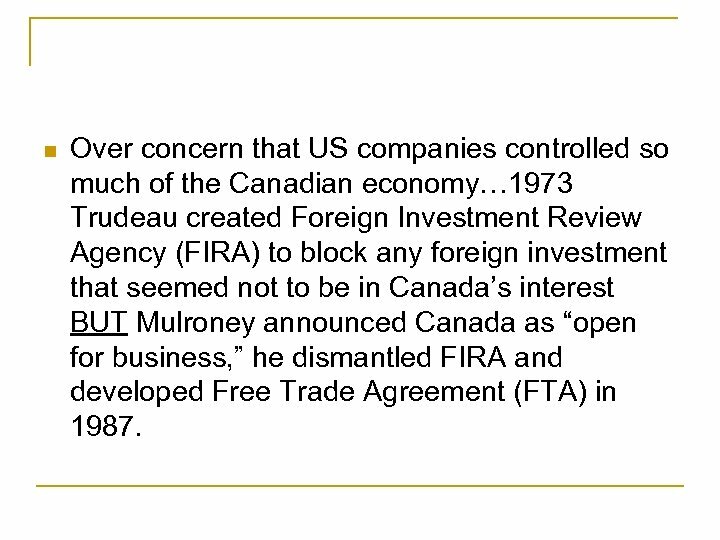 Over concern that US companies controlled so much of the Canadian economy… 1973 Trudeau created Foreign Investment Review Agency (FIRA) to block any foreign investment that seemed not to be in Canada’s interest BUT Mulroney announced Canada as “open for business, ” he dismantled FIRA and developed Free Trade Agreement (FTA) in 1987. 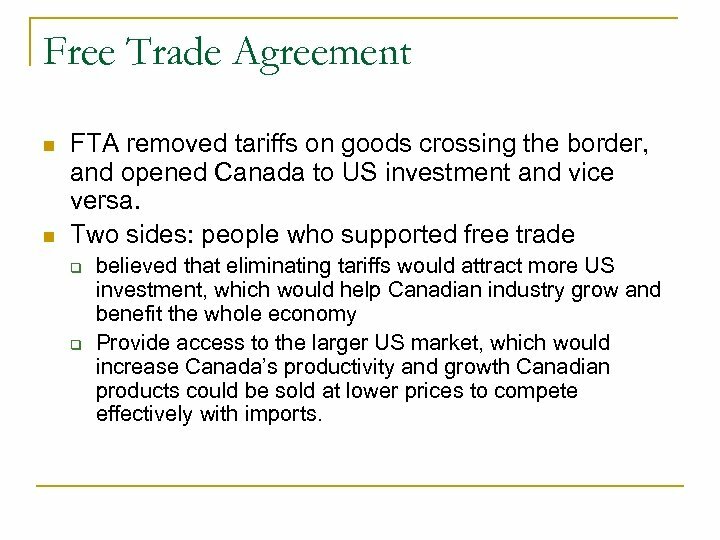 Free Trade Agreement FTA removed tariffs on goods crossing the border, and opened Canada to US investment and vice versa. 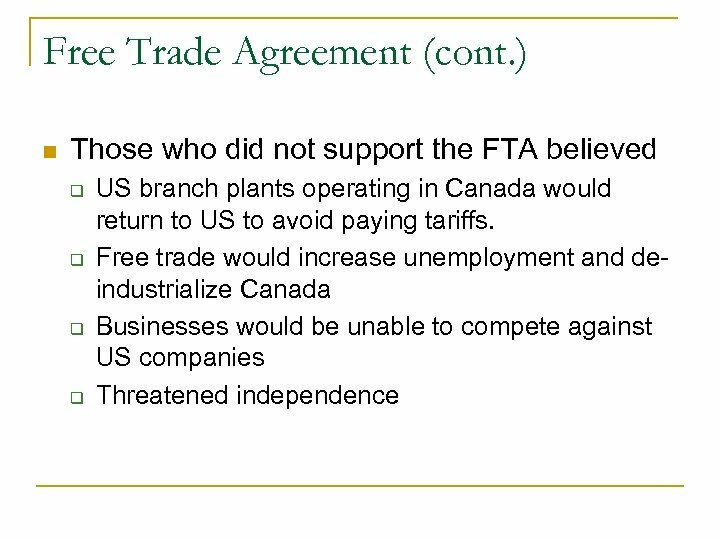 Two sides: people who supported free trade believed that eliminating tariffs would attract more US investment, which would help Canadian industry grow and benefit the whole economy Provide access to the larger US market, which would increase Canada’s productivity and growth Canadian products could be sold at lower prices to compete effectively with imports. 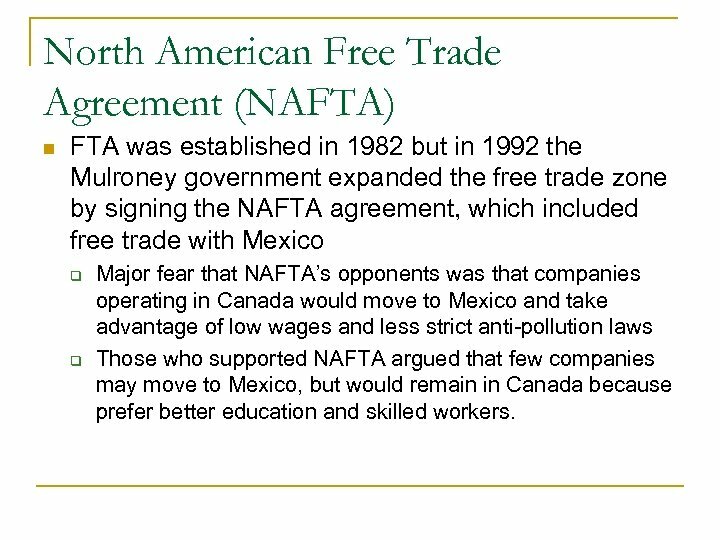 North American Free Trade Agreement (NAFTA) FTA was established in 1982 but in 1992 the Mulroney government expanded the free trade zone by signing the NAFTA agreement, which included free trade with Mexico Major fear that NAFTA’s opponents was that companies operating in Canada would move to Mexico and take advantage of low wages and less strict anti-pollution laws Those who supported NAFTA argued that few companies may move to Mexico, but would remain in Canada because prefer better education and skilled workers. 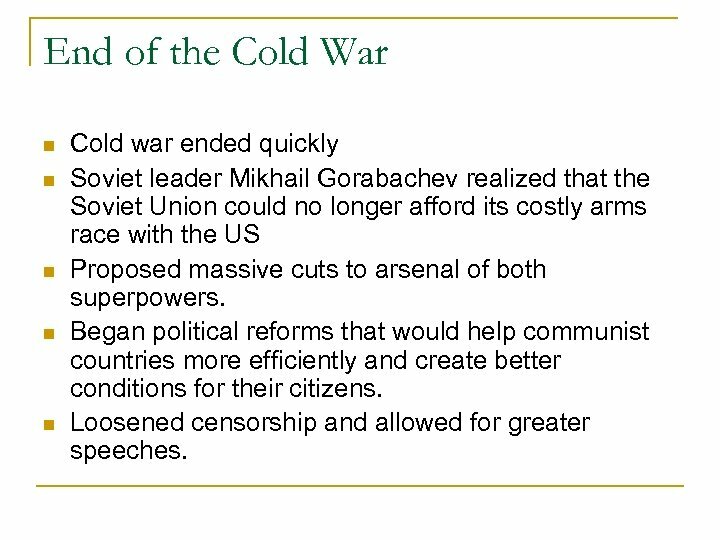 End of the Cold War Cold war ended quickly Soviet leader Mikhail Gorabachev realized that the Soviet Union could no longer afford its costly arms race with the US Proposed massive cuts to arsenal of both superpowers. Began political reforms that would help communist countries more efficiently and create better conditions for their citizens. Loosened censorship and allowed for greater speeches. 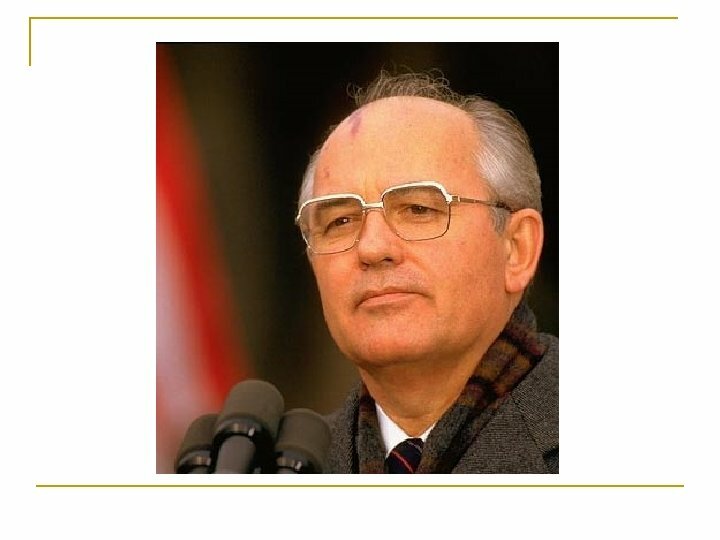 Perestroika and Glasnost (cont. ) 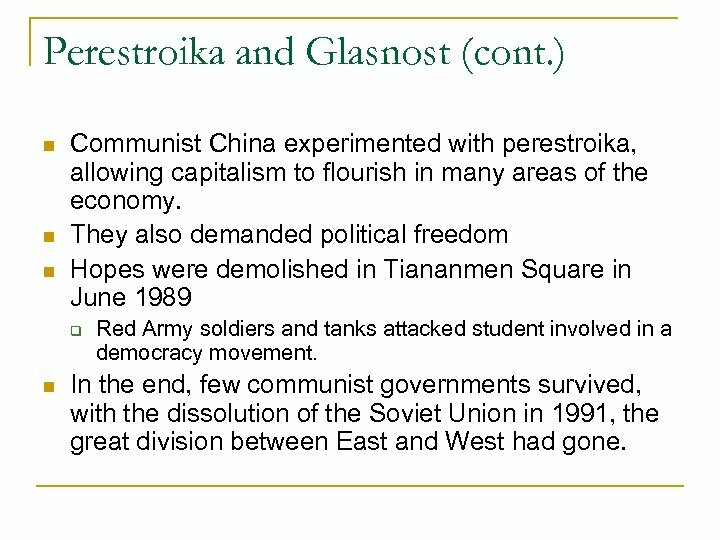 Communist China experimented with perestroika, allowing capitalism to flourish in many areas of the economy. They also demanded political freedom Hopes were demolished in Tiananmen Square in June 1989 Red Army soldiers and tanks attacked student involved in a democracy movement. 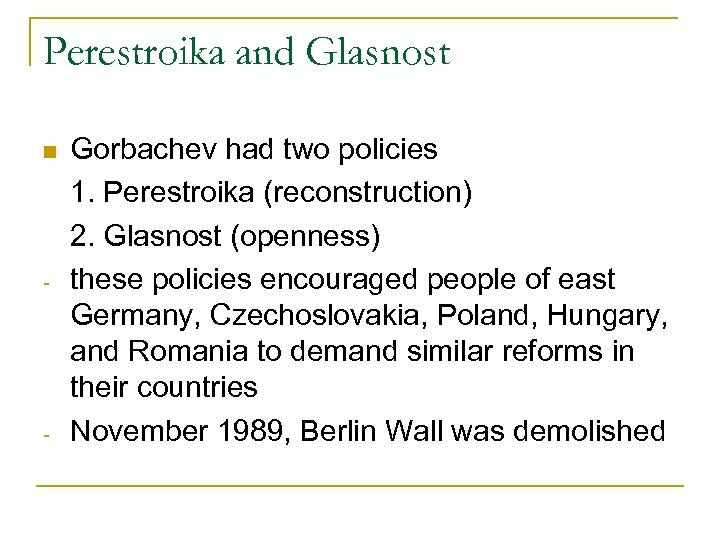 In the end, few communist governments survived, with the dissolution of the Soviet Union in 1991, the great division between East and West had gone. Tiananmen Square (top left): What you would not see from Google in China. 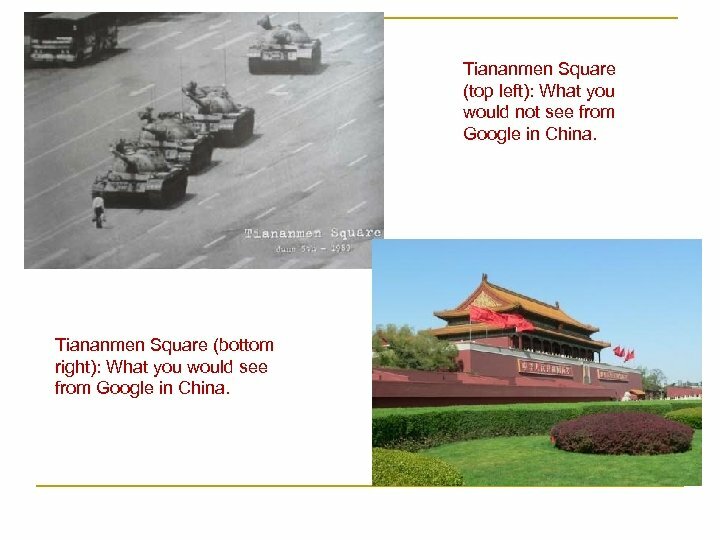 Tiananmen Square (bottom right): What you would see from Google in China. 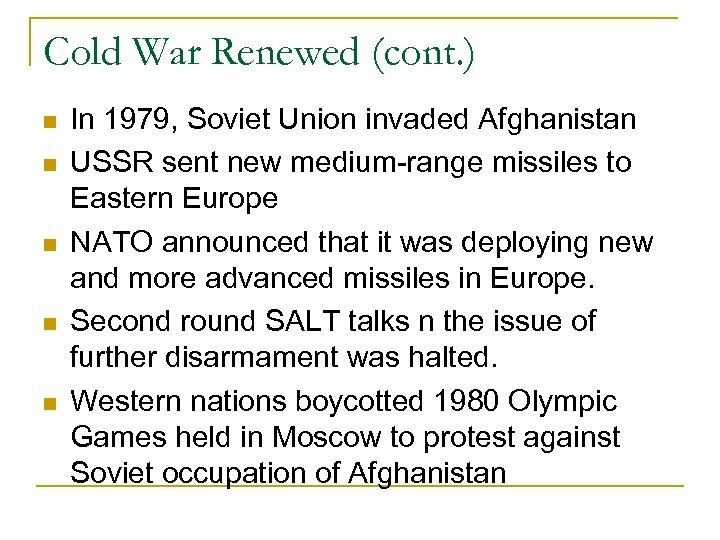 New World Order End of the Cold war brought regional conflicts. 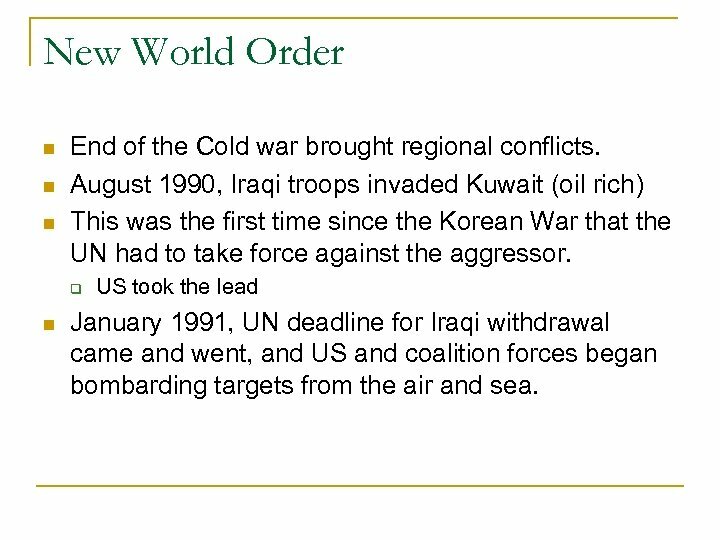 August 1990, Iraqi troops invaded Kuwait (oil rich) This was the first time since the Korean War that the UN had to take force against the aggressor. 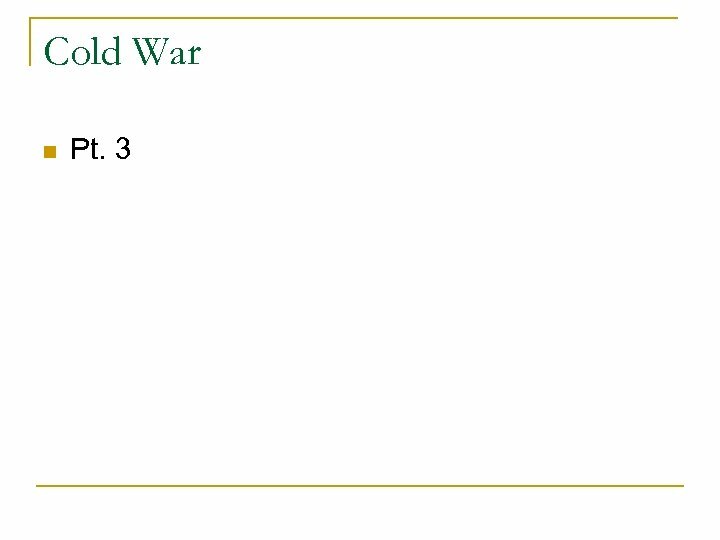 US took the lead January 1991, UN deadline for Iraqi withdrawal came and went, and US and coalition forces began bombarding targets from the air and sea. 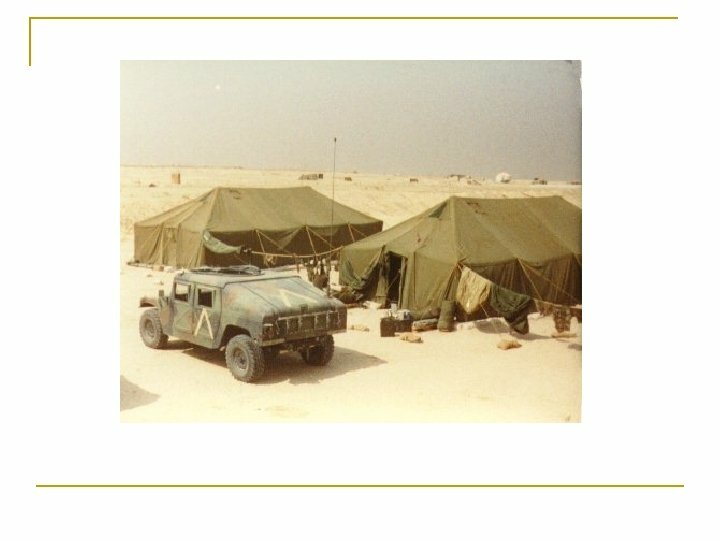 The Gulf War Canada participated with a squadron of CF 18 fighter bombers, Canadian army units, shops from the Canadian Army and the “operation Desert Storm” had begun. The Gulf war destroyed the Iraqi fighting force and much of the country’s infrastructure. 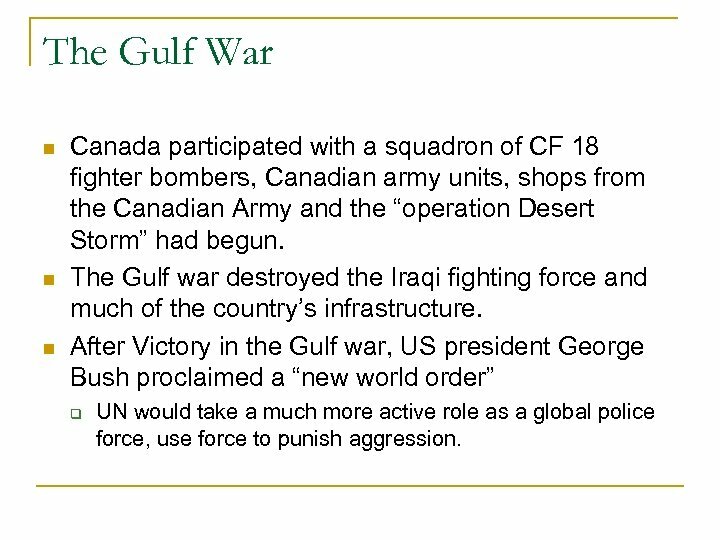 After Victory in the Gulf war, US president George Bush proclaimed a “new world order” UN would take a much more active role as a global police force, use force to punish aggression. 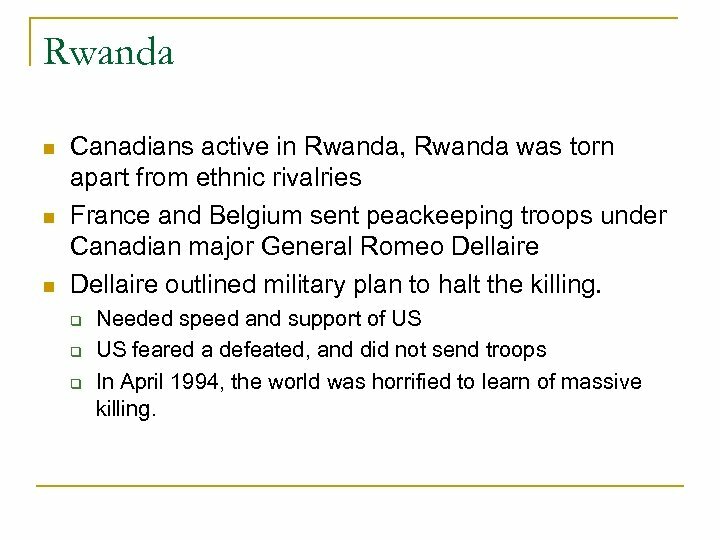 Rwanda Canadians active in Rwanda, Rwanda was torn apart from ethnic rivalries France and Belgium sent peackeeping troops under Canadian major General Romeo Dellaire outlined military plan to halt the killing. 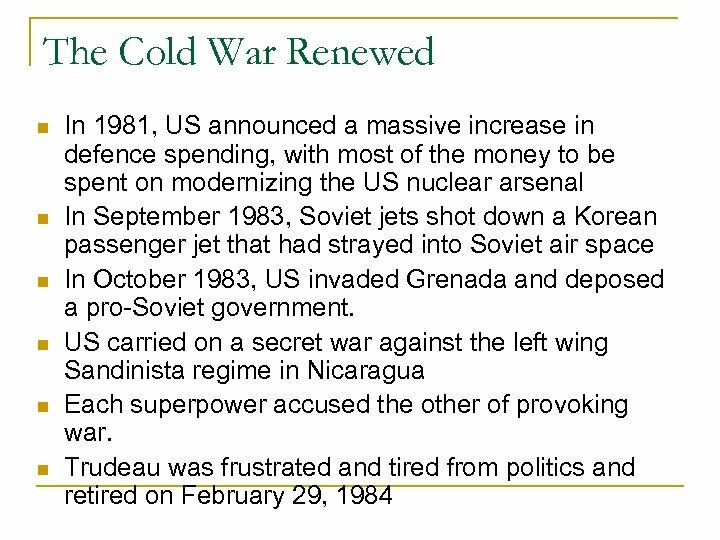 Needed speed and support of US US feared a defeated, and did not send troops In April 1994, the world was horrified to learn of massive killing. 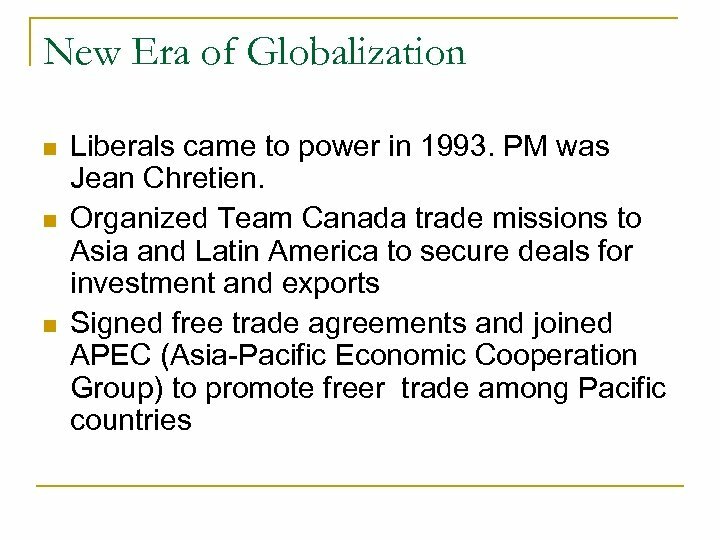 New Era of Globalization (cont. ) Trade initiatives were a part of a trend sweeping the world by the end of the 20 th. 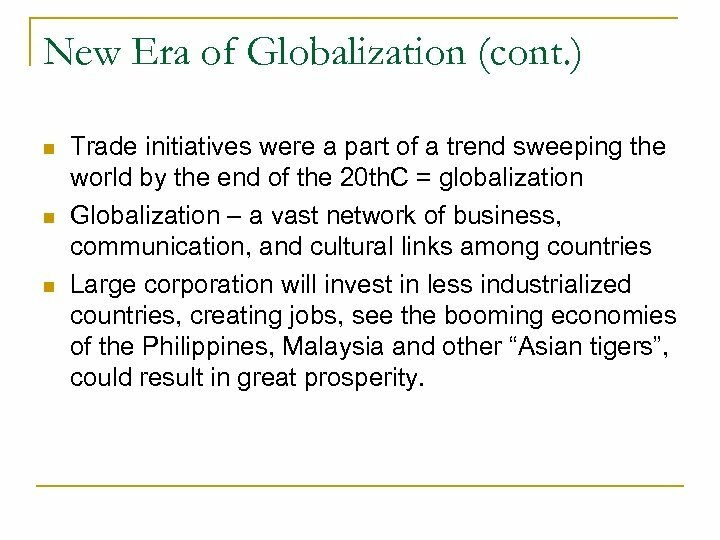 C = globalization Globalization – a vast network of business, communication, and cultural links among countries Large corporation will invest in less industrialized countries, creating jobs, see the booming economies of the Philippines, Malaysia and other “Asian tigers”, could result in great prosperity. New Era of Globalization (cont. ) 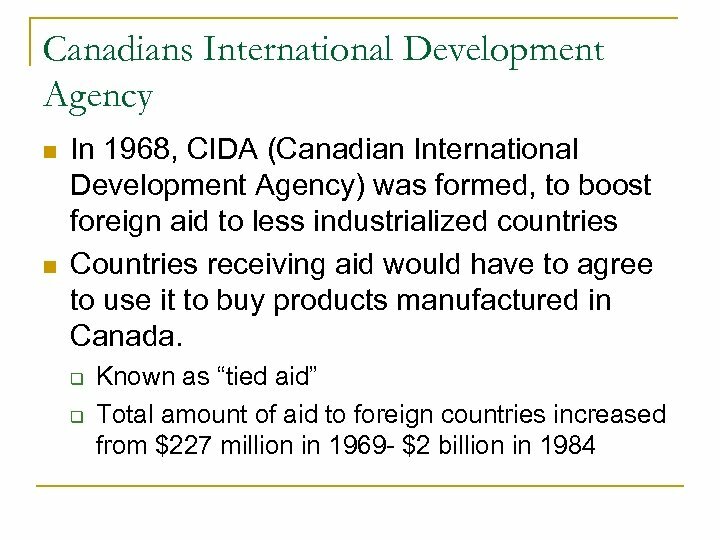 But, they hit an economic crisis, which effected Canadian economy, especially BC since Asian markets for lumber, minerals, and food product diminished. 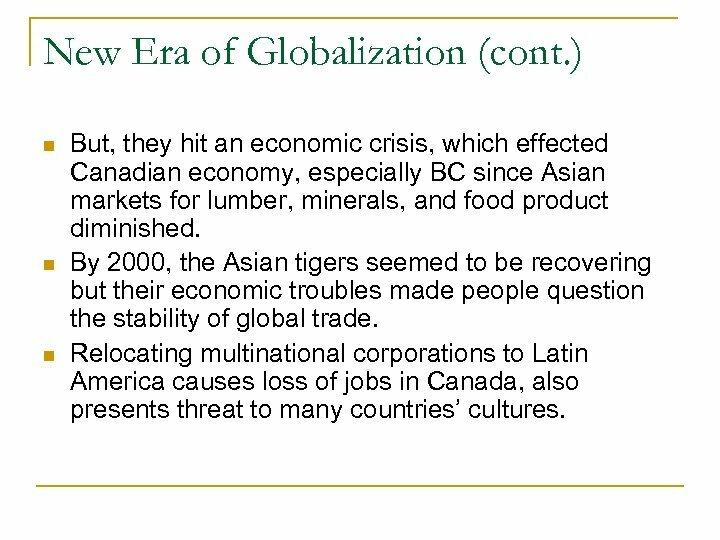 By 2000, the Asian tigers seemed to be recovering but their economic troubles made people question the stability of global trade. 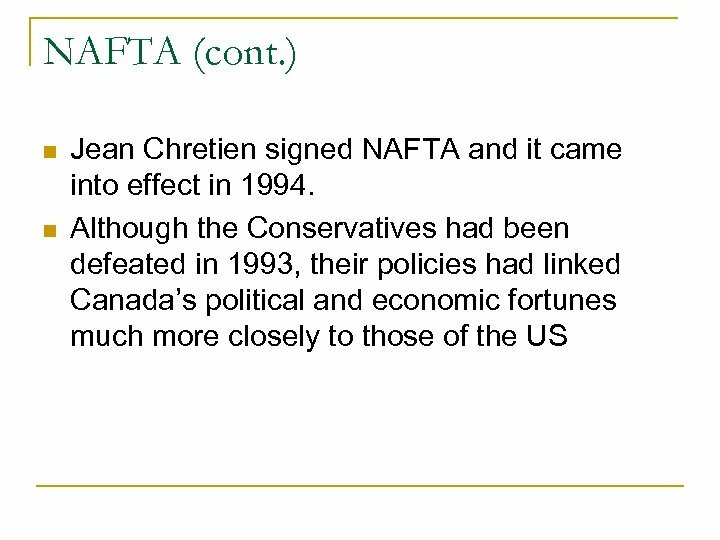 Relocating multinational corporations to Latin America causes loss of jobs in Canada, also presents threat to many countries’ cultures.